SEO is the process of using specific online techniques and marketing strategies to obtain a higher placement on the list of results returned by search engines and thus increasing website visibility. These search listings are ranked in order of what the search engine considers most relevant to what the users are searching for. 100 Billion Google searches are done every month and around 88% of all web searches in the UK are made using Google, which is why our focus is on Google’s reputable search engine. Our SEO Services also focuses on Google‘s organic search results as that is where over 60% of the traffic comes from. In addition, many web searchers don’t trust paid advertising results; therefore do not click on them. What do we mean by 'Grow your business organically'…? Well, when it comes to search engines there are two main methods to get higher ranking on Search Engine Results Pages (SERPs). One method is organic search, where you naturally position your website so that it will appear higher in the results listings for certain keywords that your potential customers are searching for. The other method is paid search, which are advertisements on the very top of the results page and on the right hand side displaying the icon. This is where websites have paid Google for certain keywords and have set up their Ads. These results display when a user types a search query containing those particular keywords. 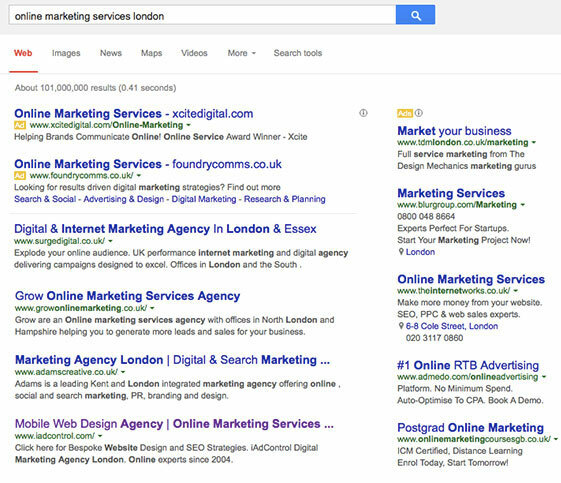 The search results image is an example of organic and paid search on the first page of Google for keywords 'Online Marketing Services London'. You can see iAdControl is forth in the organic listings. To maintain these listings is part of our intensive monthly SEO campaign. Some of the links below open in a new window. iAdControl is not responsible for the content of external websites. Please download Adobe Reader to view the above PDFs documents. The above public suggested resources will be updated as we see fit.